Over his four and a half decades in the private practice of dentistry, Dr. J Tim Rainey of Texas has strived from the time he opened his practice to present to create a safe and clean office environment. The recent destruction of his office by hurricane Harvey and follow up remodeling gave him an opportunity to put the finishing touches on creating the cleanest office environment in dentistry following sound, scientific guidelines. His office remodeling project has enabled him to develop a working prototype for any other medical, dental, or veterinarian office to follow to easily create a clean and safe environment for all office personnel and their patients. The second part of this life’s project has been creating the cleanest and safest office environment for his patients, staff, and himself! Dental Unit Water Line contamination has been recognized for decades with several deaths among the patient population traced back to DUWL’s as well as a dentist’s death due to his own water line contamination! Since this is a very difficult connection to make, it is assumed that sickness from the dentist’ water lines is much more common than otherwise identified. As with all inventions, new technology is developed that makes old technology obsolete. Dr. Rainey’s original dental unit utilized the second most common cleanser in the food industry to provide safe water to his patients, chlorhexidine. The same surface stickiness that wiped out bacteria also created a maintenance problem for the dental units. The chlorhexidine would attach to the “0” rings in the dental unit’s switching valves and the valves would stick unless the dentist ran food grade alcohol though the units on a regular basis to keep the valves from sticking, an insurmountable maintenance problem for most dental offices. The instrumentation dentists use creates a pathogenic plume from the patients mouth potentially dangerous to anyone exposed. How pathogenic? One of the markers used to determine exposure in a dental office to plume borne pathogens is the serum titer of Legionella infection. The front desk personnel in most dental offices is twice that of the general population! This means that the pathogenic “plumes” dentists create while working in the mouth somehow makes its way to the front desk and the personnel there are exposed to whatever is in that “plume” with Legionella being the easiest to detect. We have small free standing HEPA filters in the far corners of the office treatment rooms, and the central air conditioner has the largest HEPA filter that will fit the air handler as well as UV light sterilizers. It has also been shown that the instruments used by physicians to “burn” lesions creates a pathogenic plume. Physicians and their staff have been treated for nasal warts directly related to inhaling the “plume” created when burning off papillomas (warts) on various parts of the body. Keep in mind that these contaminated plumes can be diffused to any part of the office and can contaminate anything and anyone in the office. Think about the implications of everyday home use of this unit! The same technology we use in the office can easily be installed and used at home with the Biolux Hydrogen Fountain unit. a. Just the washing of hands with soap has been shown to decrease the transfer of bacteria and viruses from person to person. Think of how much more effective Ozone is in reducing the transfer of viruses like the common cold and flu viruses. b. 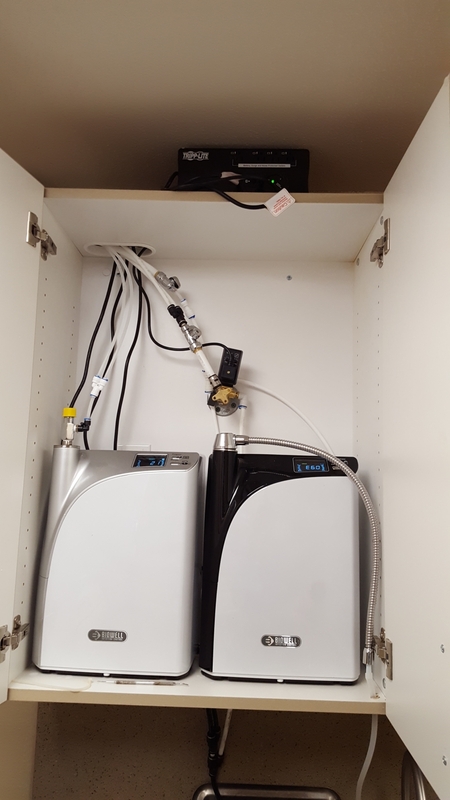 We now have an Ozone water unit (the Biolux) that can be used in the home for the same reasons we use the Ozone water generators in the dental office. In house hold use, it would be mounted near the sink. Ozone is the most powerful bactericidal agent in nature. Ozonated water achieves rapid and effective disinfection and bacteria elimination in 10-20 seconds. c. Any home with a Reverse Osmosis system is ready for installation of a Biolux, and many municipal water supplies provide quality water sufficient for direct use. A simple test with a $5 TDS meter (Total Dissolved Solids meter) will determine the readiness of the water source. d. Pesticides/insecticides: Rinsing vegetables and fruits directly with ozonated water rapidly and effectively degrades pesticide residues as tested by SGS. Ozonated water removes pesticide residue in 1-2 minutes and makes the “shelf life” longer. e. Rinsing fish, shrimp, meat and poultry directly with ozonated water provides rapid and effective disinfection, bacteria and microbe elimination as well as pollutant removal. f. Ozone water rapidly and effectively eliminates any “fishy” smell” and orders when used for direct rinsing. g. Ozone water has several disinfecting and bactericidal applications in daily life: hand-washing, tableware, household utensils, knives and forks, bowls and chopsticks, cutting boards, dish rags, towels, as well as baby’s pacifiers, feeding bottles, and diapers. Ozonated water is instantly effective in disinfecting C PAP hoses and masks. Mopping floors with ozonated water disinfects floors with no chemical residue. Wetting cleaning and dish rags allows simultaneous disinfection of both hands and surfaces. h. Ozone water can be added to washing machine water to provide a more effective and gentler disinfection better than Clorox without the risk of chlorine bleaching. 2. The Biolux unit also generates Hydrogen infused gas. a. Drinking Hydrogen infused water facilitates the immune system's scavenging of harmful ROS including hydroxyl and perioxinitrates while leaving the beneficial ROS. b. Hydrogen is the most recently discovered antioxidant capable of increasing the immune system antioxidant, anti-inflammatory and anti-apoptotic capabilities. Meanwhile Hydrogen protects DNA and ensures cell survival and possible cellular damage or destruction by blocking hydroxyl radicals. d. The reduction effect from drinking Hydrogen water neutralizes excess free radicals formed as a result of body acidification, effectively suppresses the symptoms and improves physical fitness after acidification and restores health. a. Hydrogen molecules are small and can quickly penetrate the biofilm and then diffuse through the cellular membrane into cytoplasm, mitochondria and nuclei. b. The effective dose of hydrogen is not toxic nor is a large dose of Hydrogen harmful. c. Hydrogen is a moderate antioxidant which does not interfere with the oxidation-reduction reaction of metabolism. d. Hydrogen has better compatibility with tissues and organs compared to other antioxidants. Hydrogen is also easily degassed through the lungs. After successfully addressing the problem of dental unit water line contamination, Dr. Rainey addressed the problem of overall office sterility. The problem of office air and surface contamination is addressed through the use of several adjuncts including multiple full time HEPA filters. UV lights in the central air handler, and diffusion of Ozone gas weekly when the office is vacant. Another layer of protection for occupants of the office is by utilizing the commonly known UV light in the central air handler before the HEPA filters. These UV lights act by the UV radiation creating Ozone gas in exposed microbes. Ozone is the mammalians (our bodies included) natural defense against microbes. Microbes have no resistance to Ozone gas which immediately destroys the cell walls of exposed microbes (bacteria, viruses) making the HEPA filter more efficient in removing the particulates that pass thought the UV radiation. In addition to our central air handler UV lights and HEPA filters, the office environment is also super saturated for 24 hours on weekends with Ozone gas! Ozone technology is what hotels use to decontaminate a room when a smoker violates the rules and stinks up a room with second hand smoke. Ozone will destroy smoke, nicotine, pollutants and other organics out of the air and on the surfaces and is equally effective against microbes! Since long term exposure to high concentrations of Ozone gas will cause lung irritation, we have a “make air” system that will exhaust all the air in the office in less than seven minutes. If the employees are confronted with that heavy “rainstorm aftermath” fresh Ozone smell when arriving on Monday morning, they can flip the switch and change the air in the office immediately! The free standing HEPA filters are turned off when Ozone is being released and the central air handler is turned to the automatic setting to minimize destruction of the Ozone gas, maximizing exposure of office surfaces to Ozone. For more information, please refer to Dr. Rainey’s website, www.jtimrainey.com and click on the informative Biowell and Biolux articles.